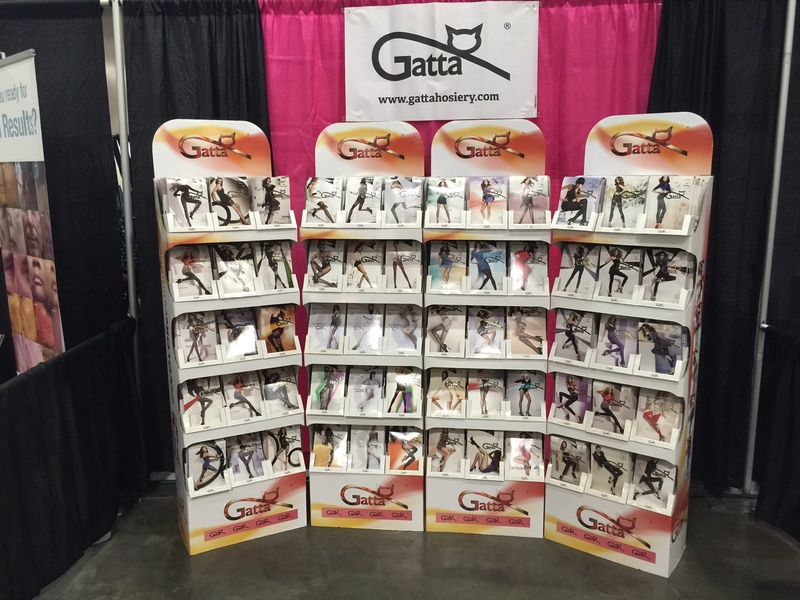 Now that the Halloween hiatus is over, and there's actually a little bit of time left at the end of the day to reminisce about events past, I thought I'd write about what actually transpired happened two weekends ago, at the LA Ultimate Women's Expo, where Gatta Hosiery team was exhibiting Gatta Products. Since it was our first time at such a large show, the anticipation was at the maximum. The morning was spent setting up the booth and settling in, getting ready to know our neighbors and the surrounding booths. Our beautiful girls on the packaging did all the "talking" and marketing for us. Nothing else needed to be added. And this is me, wearing my signature tattoo-looking Missy Ann 01 Tiger Head Tights. Yes, people did come up to me on a few occasions and asked me if I had real tattoos, and even wanted to touch my legs ( a bit inappropriate I say, but anything to convince I' not that crazy, at least not yet). 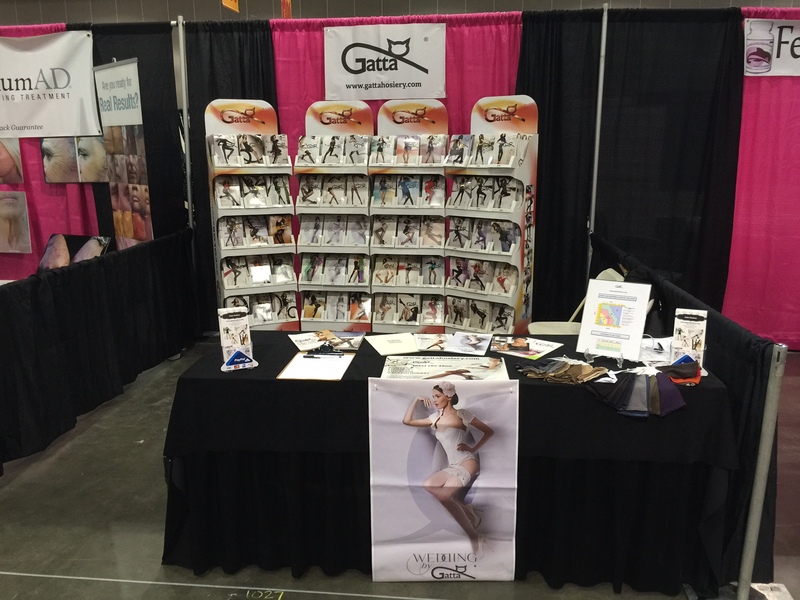 Samples, samples, samples... feel the comfort of Gatta, see the abundance of colors, decide on the density of your tights and leggings... all at our table. Saturdays are not the best days really to invite people for an early morning event, as most of the visitors that were coming in at 10 AM at the door opening, were looking as if they just woke up, yawning and just dragging their feet after their body. So I decided to take the opportunity to do a quick walk around, to see what else was going on. Surprisingly, quite a bit of fund stuff that I knew I was going to unfortunately miss, because I would have to stand by our booth (not to worry we did get our share of excitement when a celebrity visited us, I'll tell you who further down). What a beautiful Red Carpet!!! No papparazi, no limouzines! Still a minute of fame is all a girl needs! These cushiony seats felt so good to sit down after a whole day of standing on high heels. The folks on this makeover stage were just a tad bit noisy, but I think it was part of their routine: get women excited about their makeovers. I had to stop for a minute to observe some of the women getting their make up done, simply amazing, some scary, in a character. Alcohol... sponsored by Ralphs! I wonder if they would start adding wine tasting tables in Ralphs isles, wouldn't that be something? More alcohol! In bigger bottles. Vodka! Hopefully flavored, and not on the rocks, or that would be too harsh. The Jockey girls were impressed by my tights, so I showed some interest in being impressed by their booth. As I got back to our booth after a short walk around the other isles, it appeared that in isle 1000 (where we were), there was a bit of a commotion going on. And the next thing I know the wonderful Marilu Henner stopped by to do some shopping at our booth! And she was so nice to even take a photo with us! Thank you Marilu! Such a down to earth person, despite her celebrity status. As the day went on, and especially more on Sunday, visitors started flowing in. At times, we had to get out of our booth to give everyone inside some space to do their browsing. Our products were so different from what everyone has seen out there that some people couldn't decide on what to get at their first visit and came back later, to look over what we had again. One lady said she wanted to have all of our tights and leggings. Oh, and I almost forgot, there was another celebrity citing at the Expo: the one and only Mario Lopez was there for his book signing. I had a chance to deliver some goodies from our booth for his wife. All I saw was that our bag was being taken to him by security. I hope it made it to him. And if so, a simple thank you would have sufficed from his team. Haven't heard anything back. A bit disappointing but I'll live. So was it worth exhibiting at the Expo? Definitely. Would I recommend it to my friends and family and our customers to come visit us next year? Absolutely! It was a weekend full of girl things to do, getting make up and hair done, sipping on some free wine or alcohol, shopping for interesting products and more. Who wouldn't want all of this under one roof?